Preprints (earlier versions) of this paper are available at http://preprints.jmir.org/preprint/8311, first published Jul 01, 2017. Background: Researchers are currently investigating the feasibility, acceptability, and efficacy of digital health interventions for people who experience severe mental health problems such as psychosis and bipolar disorder. Although the acceptability of digital health interventions for severe mental health problems appears to be relatively high and some people report successfully using the Internet and mobile phones to manage their mental health, the attitudes of mental health care staff toward such approaches have yet to be considered. Objective: The aim of this study was to explore mental health care staff experiences of clients with severe mental health problems engaging with the Internet and mobile phones to self-manage their mental health and their views toward these behaviors. The study also sought to examine the opinions expressed by mental health care staff toward digital health interventions for severe mental health problems to identify potential facilitators and barriers to implementation. Methods: Four focus groups were conducted with 20 staff working in mental health care services in the North West of the England using a topic guide. Focus groups involved 12 staff working in secondary care psychological services (7 participants in focus group 1 and 5 participants in focus group 4), 4 staff working in a rehabilitation unit (focus group 2), and 4 staff working in a community mental health team (focus group 3). Focus groups were transcribed verbatim, and transcripts were analyzed thematically to identify key themes that emerged from the data. Results: Four overarching themes, two with associated subthemes, were identified: (1) staff have conflicting views about the pros and cons of using Web-based resources and digital health interventions to manage mental health; (2) digital health interventions could increase access to mental health support options for severe mental health problems but may perpetuate the digital divide; (3) digital health interventions’ impact on staff roles and responsibilities; and (4) digital health interventions should be used to enhance, not replace, face-to-face support. Conclusions: This study is the first, to our knowledge, to qualitatively explore the experiences and attitudes of mental health care staff toward individuals with severe mental health problems using the Internet, mobile phones, and digital health interventions to self-manage their mental health. Understanding the positive and negative experiences and views shared by staff toward both current and potential digital health intervention use has enabled the identification of several considerations for implementation. Additionally, the findings suggest mental health care staff need clear guidance and training in relation to their responsibilities in recommending reputable and secure websites, forums, and digital health interventions and in how to manage professional boundaries on the Internet. Overall, the study highlights that digital health interventions could be well received by staff working in mental health services but importantly, such management options must be presented to frontline staff as an avenue to enhance care and extend choice, rather than as a method to reduce costs. Mobile phone and Web-based psychological interventions, or digital health interventions, are increasingly being developed for people who experience mental health problems. Indeed, the National Institute for Health and Care Excellence has recommended the provision of computerized cognitive behavioral therapy (cCBT) for the treatment of depression and anxiety . However, the Five Year Forward View, an initiative by the UK National Health Service (NHS) aiming to reform current services and transform care, highlights the current limited use of technology within services and sets out the priority to harness technology within clinical settings . To this end, the NHS has approved a number of websites and mobile phone apps for a range of mental health problems  and has recently launched an early version of the NHS Digital Apps Library that catalogues a number of apps aimed to help people manage their health care needs . Some individuals who experience severe mental health problems such as psychosis and bipolar disorder report already using the Internet and mobile phones to self-manage their mental health. For example, some use the Internet to search for health-related information such as medication, diagnoses, and symptoms and to discuss their mental health on the Internet with others [5-10]. Additionally, staff working in mental health care services have reported largely neutral or positive attitudes toward the use of digital health interventions for the management of mental health problems [11-17] but are cautious about using digital health interventions for severe and complex cases [15-17]. Specifically, many believe that digital health interventions could improve access to psychological interventions, increase comfort in disclosing information, normalize experiences and reduce stigma, monitor clients’ symptoms, evaluate therapeutic outcomes, and promote help-seeking behaviors [14-17]. However, staff also have numerous concerns about digital health interventions, including the perceived inferiority in comparison to face-to-face support, limited guidance with regard to efficacy and credibility, ethical concerns if clients report that they themselves or other people are at risk, potential breaches of data confidentiality, and limits in clients’ technology access and skills [13,15-17]. An evidence base is emerging regarding current Internet and mobile phone use for self-management reported by people with severe mental health problems, but there is a paucity of research examining the experiences and views of staff toward these behaviors. Additionally, although several studies have explored service user views regarding the hypothetical acceptability of digital health interventions for severe mental health problems (ie, the acceptability before or without receiving an intervention) , much of the current research investigating staff views is based on cCBT for mild-to-moderate mental health problems, rather than digital health interventions more generally for severe mental health problems. Digital health interventions based on approaches such as CBT , psychoeducation [20-22], and mindfulness  are being offered in a research context for people with severe mental health problems. However, to successfully implement digital health interventions, it is important to understand the views and concerns of staff who will be required to promote and support their use [24,25]. 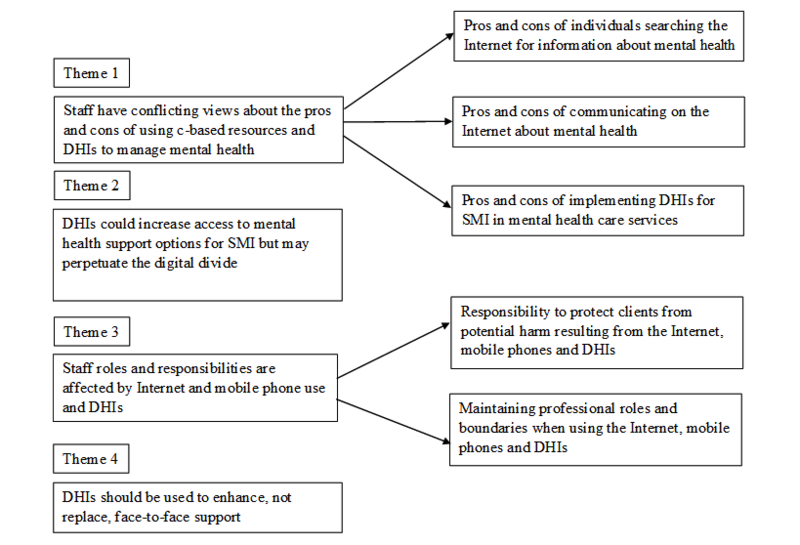 Therefore, this study aimed to (1) investigate the experiences and views of mental health care staff toward clients with severe mental health problems using the Internet and mobile phones to manage their mental health and (2) explore opinions expressed by mental health care staff (hypothetical acceptability) toward digital health interventions for severe mental health problems to identify the potential facilitators and barriers to the implementation of digital health interventions in mental health care services. Focus groups were used as a convenient way to explore a range of staff views while minimizing the burden of participation. Through the process of group discussion, they also facilitated the development and elaboration of ideas that may not have been previously articulated . Participants comprised mental health care staff working in the NHS based in the North West of England and recruited via convenience sampling. Service leads working in mental health services were approached via email by the researchers enquiring as to whether they would be open to presenting their staff with the opportunity of participating in a focus group. The researcher then liaised with the service leads to arrange the focus groups with staff who had expressed an interest in participating. The lead researcher had no established relationship with any of the participants before the start of the study. Four focus groups were held across three mental health trusts in the North West of England from April 2016 to September 2016. Focus groups involved staff working in psychological services, a community mental health team, and a rehabilitation unit and lasted between 30 and 60 min. Before the audio-recording of the focus groups, participants were presented with consent forms and a brief demographics and technology ownership questionnaire to complete. NB conducted all focus groups using a topic guide (Multimedia Appendix 1) in a private room in participants’ workplaces. Questioning focused on two key areas: (1) staffs’ experiences of clients’ use of the Internet and mobile phones and (2) views about the acceptability of implementing digital health interventions for severe mental health problems in mental health care services. NB kept field notes throughout focus groups, completed a reflective journal, and reviewed the topic guide and transcripts after each focus group to identify any additional areas of discussion that naturally arose. Data were analyzed thematically to understand common themes arising in response to the research questions . After the focus groups were completed and transcribed, NB (PhD student, psychology) read each transcript repeatedly for data familiarization and initially coded the transcripts in a cyclical process, returning to previous transcripts when new codes emerged. The other members of the research team (academic clinical psychologists SB and FL) also independently read and assigned codes to the first group transcript, and the team met to discuss and compare codes and develop an initial coding scheme. NB continued to develop this coding framework by analyzing the remaining transcripts and started to draw out preliminary subthemes emerging from these codes. Further team discussion was used to refine and create a final set of themes that reflected participants’ views and experiences across all focus groups. These themes were presented to some of the group participants, which helped to refine the way in which the themes were presented. NB is a PhD student investigating how digital health interventions could be used to support people with severe mental health problems. SB and FL are academic clinical psychologists who are principal investigators on clinical trials implementing digital health interventions for this population and have extensive experience in conducting and supervising qualitative studies. It is important to acknowledge that these experiences may affect the analysis and interpretation of the data, so several steps were taken to minimize the likelihood of this occurring. First, NB was careful to present the research questions in an open and neutral way with no indication of the views of the research team and encouraging people to explore the full range of views. Additionally, questions surrounding the potential benefits and drawbacks of digital health interventions were initially phrased broadly to ask staff about their thoughts surrounding digital health interventions, and the terms benefits and drawbacks were only used later for further probing. Finally, NB kept a reflective journal to consider how staff responses in each focus group affected her own views about digital health interventions throughout data collection, analysis, and reporting and tried to take this into consideration when analyzing the data. The study received ethical approval from NHS Cambridge South Research Ethics Committee (ref: 16/EE/0059). All participants provided verbal and written consent for participation, audio-recording of focus groups, and the use of direct quotations in publications resulting from the research. Participants did not receive any financial or professional incentives for participation. A total of 20 mental health care professionals were recruited across four focus groups. A summary of participant characteristics is presented in Table 1. Thematic analysis of focus group data generated four key themes and five subthemes: (1) staff have conflicting views about the pros and cons of using Web-based resources and digital health interventions to manage mental health; (2) digital health interventions could increase access to mental health support options for severe mental health problems but may perpetuate the digital divide; (3) digital health interventions impact on staff roles and responsibilities; and (4) digital health interventions should be used to enhance, not replace, face-to-face support. A diagram of the themes and associated subthemes is presented in Figure 1. It’s instant for them at a time when they’re needing answers...It’s there at their fingertips. They don’t have to wait...until the clinic opens to speak to the CPN. ...she’d done a lot of research herself...so when she came into therapy she was in a very different place than a lot of people because she kind of already started herself. a1=extremely uncomfortable and 6=extremely comfortable. Table 1. Summary of participant characteristics (N=20). Figure 1. Diagram of themes. There are some good YouTube videos...around compassion focussed therapy...we’ve done that together...so I guess if it’s done in a clinical setting in a careful way it’s been massively useful...in terms of normalising particularly and de-shaming. Across all focus groups, staff also revealed that they searched the Internet for information about their own mental and physical health care needs. Consequently, they understood and related to clients’ information-seeking and were generally willing to embrace, encourage, and, if needed, guide this behavior. Indeed, staff expressed that they would specifically want to see psychoeducation included within future digital health interventions. These comments reflect current Internet information-seeking behaviors by both staff and clients alike and suggest that staff would be positive about the provision of psychoeducational material in digital health interventions. I had a client in the past who bought... something...from America. He thought it was gonna cure his mental health problem...he ended up on the ward...but that was his belief that he read it on the Internet that if he got this substance it would make him better. It can feed your delusions. The term trusted websites was, therefore, mentioned frequently, with specific examples of charitable and national organizations. Private company websites such as pharmaceutical companies, private counseling and psychotherapy services, and unmoderated chat rooms were viewed as untrustworthy sources of information. Although staff noted that they themselves actively engaged in Web-based information-seeking, they had concerns about the vulnerability of clients. Specifically, staff felt that they had the training and experience to filter potentially biased or inaccurate information but that the general public (including clients) may not have such capabilities. Therefore, staff were keen to see the promotion of greater awareness regarding the potential dangers of unregulated websites. In summary, staff expressed many positive and negative experiences of clients searching the Internet for information about mental health. Specifically, Web-based information had been a helpful resource before, and in-conjunction with, face-to-face therapy and could be accessed at any time clients needed information. However, negative experiences of clients accessing unhelpful Web-based content had led to concerns regarding the quality and trustworthiness of Web-based information. A lot of the forums you have pseudonyms and stuff don’t you...so you do feel more open and able to express yourself and your opinions more freely. People who struggle to relate to other people...they don’t have to leave their comfort zone in a way to almost be with people. It’s kind of an interim position perhaps. The positive experiences of social media websites and forums reflect the perceived utility of these resources as pathways to receive peer support and to connect with others with a shared understanding. Staff suggested strategies that could be used to manage this, such as ensuring that forums are moderated. Staff working in a community mental health team even suggested that NHS Trusts should offer their own moderated forums for clients to engage with, reflecting the level of importance staff placed on forum provision and moderation. In summary, staff believed the opportunity to connect with others with a shared understanding and the potential for accessible peer support was a benefit of Web-based communication and could be incorporated into future digital health interventions. However, staff had experienced or were concerned about the potential drawbacks of cyberbullying and trolling, overdisclosures, and Web-based communication about engaging in suicidal behaviors. However, staff in all focus groups raised fears that companies or individuals could be able to hack digital devices and obtain sensitive user information and responses. These concerns reflect the dilemma that although digital health interventions may increase privacy, this may still be limited because of the potential security issues associated with using technology. ...I was sort of looking at that as a way of getting her to monitor her moods over a period to try to understand a bit better the pattern of what was happening with her and why. However, staff working in secondary care psychological services and a community mental health team felt continuous monitoring may become tiresome and could lead people to unhelpfully dwell on experiences. Therefore, the suggestion was made that monitoring via digital devices should also involve recording positive events for people to identify, recognize, and acknowledge. ...it could be like I have no symptoms no problems right now, can I get out of hospital now? Staff responses regarding the potential benefits and concerns about digital health interventions reflect the mixed views toward this approach. Specifically, concerns regarding data confidentiality and truthfulness of responses need to be addressed to ensure that staff feel comfortable recommending clients to receive digital health interventions. I am beginning to see a pattern emerging with participants displaying particularly strong views towards the idea of the NHS funding devices. As soon as the digital divide barrier is raised by participants, the view that the NHS should not pay for devices is raised almost immediately. When I then try to explore why, this question is met with polite laughter at the thought that the NHS should make these provisions. Therefore, the overall position of staff was that the NHS would not have the resources required to supply the devices needed to deliver digital health interventions. Although potential issues regarding access and capacity were raised, participants in all focus groups were still able to recall experiences of clients actively engaging with digital devices to self-manage their mental health, including (1) accessing information about medication, diagnoses, symptoms, personal stories, and coping strategies; (2) using forums and social media websites to discuss mental health; (3) using mobile phone cameras to photograph formulations during therapy sessions; (4) using alarms and calendars on mobile phones for appointment and medication reminders; and (5) using apps to receive already existing self-management options. Findings from this theme suggest the digital divide may be a barrier that prevents mental health care staff from supporting the implementation of digital health interventions into clinical practice. Specifically, concerns were raised by participants about clients’ basic technology skills and ownership, and staff questioned how some would be able to afford access to digital health interventions. However, this theme also identified the potential facilitator to implementation that some individuals and staff are already using digital devices for self-management. I get the sense that staff feel a huge burden of responsibility towards protecting their clients from harm and take this responsibility incredibly seriously. Staff expressed strong concerns that they would be required to supervise clients using the tablet, when their time would be better spent elsewhere. It felt like staff believed tablets could be positive, but the limited staff resources would mean the provision of tablets at this time would be a burden for staff; not a helpful addition. Whilst conversations remained positive, two participants did raise their voices and spoke emotionally about their fears regarding the additional responsibilities and work pressures associated with the acquisition of a tablet for the unit. ...if somebody’s really low and threatening suicide, what responsibility do you have for that; what would be their expectations? What if it gets to you when you’re in an appointment and you can’t respond to it until the next day? Staff working in secondary care services also described devoting time within sessions to reflect on friendships clients had formed on the Internet over topics such as suicide pacts and self-harm strategies. Additionally, staff in these focus groups had experiences of providing psychoeducation to address misinformation that clients had obtained on the Internet. These past experiences had contributed toward concerns about the availability of unregulated Web-based material and Web-based discussions surrounding mental health. To summarize, staff recounted several experiences of clients accessing Web-based content that led to negative consequences. Therefore, staff felt paternalistic toward clients’ access to this content. Additionally, concerns regarding their own knowledge of websites and apps prevented some from making recommendations and concerns raised about the potential legal, moral, and ethical implications regarding automatic symptom monitoring need to be considered during implementation. Staff were not directly asked about how the Internet and mobile phones affected their professional boundaries with clients; however, the issue naturally arose during all focus groups and was discussed at length. For example, participants reported concerns about clients sending friend requests over social media websites, the availability of personal information on the Internet that may affect professional relationships with clients, and fears that others may see personal social media posts that they disagree with and subsequently report. For this reason, many staff said they did not use social media websites or limited the amount of personal information they disclosed on the Internet. I think you have to be very careful what data is relayed in a text. If it’s simple facts of phone numbers or dates and times fine. ...and they have your number then so you don’t want to be giving it out to people who might be contacting you. Monitoring clients’ social media profiles for information about daily functioning and risk was unanimously criticized in all groups as a misuse of trust and power, which could potentially damage the therapeutic relationship. I think it could actually be quite damaging...especially if your clients have quite paranoid thoughts.. Especially when it comes to researchers who are obviously very very far removed from the real world or (.) working with people with complex mental health problems on therapy you know they might think things are a good idea...so if there’s any way that we can kind of you know just inform their thinking a little bit. Additionally, staff wanted to receive mobile phone symptom assessments directly from clients themselves rather than automatically via an app, and only one participant outwardly expressed the preference for receiving these automatically. This was so clients should take ownership of their data and choose what to share, thus ensuring that staff were not placed in the expert role. The ones that do...the best in follow up are the ones that have kept their letters and maps and have kept everything kind of accessible and have continued to use them so I guess that these could be transferable to some sort of technology. ...if there were tablets that could work outside the community that we could show and go through the process to show how simple it (an app) is and what they could potentially gain from it, I think there could be a definite place for it. It shouldn’t be used to replace face to face, but it should be used to enhance. ...it’s substituting proper therapy for something that isn’t proper therapy and anticipating or hoping that people will get better and it being a way of actually saving money and resources. Following initial reviews of these transcripts, I am yet again struck by the repetitive viewpoint expressed by staff that we should never attempt to replace in-person support with DHIs. During focus groups, it felt like staff could list a significant number of benefits of DHIs, but this overarching concern led to caution. If staff hold such dogmatic views about this issue, it may be a significant barrier to the implementation of DHIs in secondary care services. This study sought to examine the experiences and views of mental health care staff toward clients with severe mental health problems using the Internet and mobile phones to manage their mental health and the hypothetical acceptability of digital health interventions for severe mental health problems to identify facilitators and barriers to implementation in secondary care services. Staff had a wide range of both positive and negative experiences of clients with severe mental health problems using the Internet and mobile phones for self-management, and staff were cautious, but optimistic, about the implementation of digital health interventions. Web-based information-seeking was viewed positively and staff welcomed the incorporation of psychoeducation material into digital health interventions, suggesting that this could be well received by staff and service users alike. Concerns surrounding the abundance of unregulated Web-based material echo previous qualitative work, where individuals experiencing severe mental health problems also queried the trustworthiness of information from Internet sources and preferred information from organizational and charitable websites, rather than private companies or chat rooms [5,9]. Such skepticism surrounding the reliability of information found on the Internet may be warranted. A recent search for schizophrenia-related videos on the video-sharing website YouTube, revealed that only 34% accurately portrayed schizophrenia . Additionally, mental health-related information on the Internet is reportedly of poor quality , and many websites are biased toward providing information about biological causes and medical treatment options . However, a more recent study has reported that the quality of Web-based information specifically for severe mental health problems is of relatively good quality . It has been suggested that health care professionals should direct clients to appropriate trusted websites to combat issues regarding the reliability of Web-based information . In this study, staff endorsed this suggestion; however, some were concerned about their own limited knowledge surrounding websites and apps. Therefore, some participants expressed a need for a catalogue of evidence-based and NHS-endorsed resources they could recommend to clients. Recently, the NHS introduced an early version of the once defunct NHS Digital Apps Library that contains a list of NHS-approved apps for numerous physical and mental health care needs . Globally, the American Psychiatric Association has developed an evaluation model for use by staff to determine the appropriateness of apps for clients , and in Australia, the mindhealthconnect website, supported by the Australian government, lists a range of trusted Web-based tools and apps for people to self-manage their mental health and well-being . Given the enthusiasm of participants to receive information regarding credible websites and apps, it is likely that these resources would be helpful for staff to review and implement. Therefore, efforts must be made to ensure that staff are made aware of, and encouraged to use, these new resources. It has been suggested that social media websites and forums could be used to deliver interventions and provide peer support options for people experiencing severe mental health problems [35,36]. Early findings have indicated that this approach could be feasible and acceptable [37-39] and that individuals already actively access these platforms to receive support [40,41]. Although staff outlined several fears about clients engaging with social media websites and forums, they also described situations where clients had been able to connect with others on the Internet with a shared understanding. Therefore, the use of social media websites and forums to deliver interventions may be valued and utilized by people with severe mental health problems, although staff concerns such as forum moderation must be considered for successful implementation. Additionally, researchers have proposed that social media profiles may contain valuable information about individuals’ daily lives and functioning, which could be a useful tool for clinicians to make assessments and diagnoses . Staff were unanimously against viewing clients’ social media profiles and viewed this behavior as a misuse of power; therefore, staff attitudes would be a significant barrier to the implementation of this approach in services. Staff appeared to be paternalistic toward clients’ access and use of the Internet and mobile phones, with a perceived need to guide clients toward the right information; this was particularly true for staff working in a rehabilitation unit. Gatekeeping and paternalism by staff is not restricted to Internet access and digital health interventions. For example, staff have also been found to be paternalistic when deciding whether to refer clients to clinical trials  and treatment options clients should receive . Involving clients in a shared decision-making process with regards to Internet, mobile phone, and digital health intervention access is therefore key, and rather than preventing access, clients should instead be encouraged to speak with staff to help make decisions regarding access together. Although some staff believed that digital devices could increase access to evidence-based interventions, concerns regarding client access and ability to use such devices were raised. These perceptions about technology access and ownership somewhat contradict recent findings in the field. For example, a recent meta-analysis indicated a narrowing gap in mobile phone ownership between the general population and individuals experiencing psychosis . Numerous studies since this review have indicated relatively high technology access and ownership by people who experience severe mental health problems [46-48]. However, although there has been a reduction in the digital divide since 2011, some people with severe mental health problems remain digitally excluded . Therefore, those delivering digital health interventions should remain mindful of access issues within this population and ensure digital exclusion is minimized. For example, staff suggested that technology skills training programs could be offered to ensure people are able to fully engage with digital health interventions. Additionally, staff did not feel the NHS should provide digital devices for people to receive interventions because of fears that clients may lose or sell mobile phones and tablets. In contrast to this viewpoint, technology return rates have been high (86% and 95%, respectively) in two studies where digital devices were provided for participants with severe mental health problems [50,51]. This suggests that staff concerns regarding individuals’ capabilities of maintaining and returning digital devices may be inaccurate, and researchers should report device return rates to determine whether such concerns are warranted. Staff were generally optimistic toward using mobile phone apps for symptom monitoring but expressed concerns about their responsibility when receiving symptom reports from clients’ because of the fear of missing risk disclosures. Therefore, staff stated a preference for receiving symptom reports from clients directly within sessions, rather than automatically. This somewhat contradicts the current direction of mobile phone apps for symptom monitoring in this population, which, although can be used by clients to share with their care team, tend to deliver symptom reports to a central server for staff to use to identify indications of relapse [52,53]. Therefore, issues surrounding the legal and moral responsibilities of staff when viewing automatic symptom reports and their comfort in implementing such approaches in practice need to be considered. Staff in all groups repeatedly expressed the concern that digital health interventions could not, and should not, replace face-to-face care and should instead be used as an adjunct and as a method to extend choice. Such fears seemed to stem from the belief that the therapeutic relationship between client and therapist is key, and digital health interventions could never replace or mimic this relationship. There is some evidence to indicate that individuals can form a positive therapeutic alliance with self-directed digital health interventions [54,55]. However, further work is required to fully understand the therapeutic relationship in the context of digital health interventions to address the concerns expressed by staff. It is often considered best practice to return interview transcripts to participants for member checking. It was not possible to return transcripts to participants for this purpose because of the potential breaches in privacy and different viewpoints presented within focus groups. Finally, the research team have previous and current involvement in projects implementing digital health interventions for severe mental health problems. Although the researchers were mindful about reducing potential biases, it is important to acknowledge that such experiences may still affect the interpretation and analysis of data. The concerns raised by staff regarding client access to potentially harmful Web-based content reflects the need for a comprehensive, accessible, and widely disseminated resource containing links to approved websites for clients to access. Additionally, some staff expressed limited knowledge about websites and mobile phone apps they could recommend to clients and were concerned about making unhelpful recommendations. Therefore, Web-based libraries containing information about approved websites and apps such as the NHS Digital Apps Library  must be presented to staff as a potential resource they can use to identify relevant options they can recommend to clients. Additionally, paternalistic viewpoints were expressed toward clients accessing the Internet and mobile phones and staff acknowledged that Web-based misinformation and communication had often needed to be addressed in therapy. Therefore, mental health care staff must be prepared to explore and address these issues in clinical practice. Furthermore, the exploratory nature of the qualitative methodology led to the identification of new and interesting staff perspectives that have not yet been explored. Therefore, researchers could use the viewpoints identified in this study to inform the design of future surveys to explore quantitatively whether these views are prevalent on a larger scale. This study also reports numerous facilitators and barriers to the implementation of digital health interventions for severe mental health problems in secondary mental health care services. Staff views align with the general theory of implementation, which details the key constructs that influence the implementation of complex interventions in health care settings . These findings in relation to this theory suggest that technology skills training for staff and clients alike must be delivered to foster capability. Additionally, further reporting of technology return rates in clinical trials delivering digital health interventions and considerations for funding devices in service settings are needed to ensure capacity for implementation. The cautious optimism shown by staff suggests there is the potential to implement digital health interventions for severe mental health problems in secondary care services, but the identified barriers must be considered and addressed before implementation. Digital health interventions for severe mental health problems are not routinely offered in treatment because of the need to establish a more concrete evidence base. Therefore, clients are often only referred to these management options as part of a clinical trial. Although the exploration of continuous investment by staff cannot currently be determined, if digital health interventions are to be implemented within secondary care services, examination of continuous contributions by staff must be made. This study is the first, to our knowledge, to qualitatively explore the experiences and attitudes of mental health care staff toward individuals with severe mental health problems using the Internet, mobile phones, and digital health interventions to manage their mental health. Findings showed that staff had both positive and negative experiences of using the Internet and mobile phones for self-management. Additionally, a range of facilitators and barriers to implementation were identified. Although staff were generally positive about current use and able to detail many experiences where clients had found engaging with these resources helpful, some concerns were expressed regarding trustworthy websites and the security of digital health interventions. Therefore, continued and improved identification and cataloguing of evidence-based resources on the Internet and digital health interventions must be made to facilitate staff comfort in referring clients to manage their health care needs digitally. Staff approached the idea of digital health interventions with cautious optimism, but concerns regarding legal and moral responsibilities and fears over a diminished therapeutic relationship must be addressed before implementation. Importantly, staff endorsed the provision of digital health interventions for severe mental health problems as an adjunct to face-to-face support but held the fear that digital health interventions would be used as a cost-cutting strategy. Therefore, to ensure implementation, digital health interventions should be presented to frontline staff as a tool to enhance care and extend choice. NB is a PhD student funded by the MRC Health eResearch Centre (HeRC), Farr Institute, United Kingdom (MR/K006665/1).The funders had no role in the study design, collection, analysis, and interpretation of data in the writing of articles and in the decision to submit it for publication. NB is a PhD student investigating how technology can be used to deliver interventions for people who experience severe mental health problems. SB and FL are both principal investigators on clinical trials implementing digital health interventions for severe mental health problems. Topic guide used in focus groups with mental healthcare staff. Pierce B, Twohig MP, Levin ME. Perspectives on the use of acceptance and commitment therapy related mobile apps: results from a survey of students and professionals. J Contextual Behav Sci 2016 Oct;5(4):215-224. Stewart DW, Shamdasani PN, Rook DW. Focus Groups: Theory and Practice. Thousand Oaks, CA: Sage Publications; 2007. ©Natalie Berry, Sandra Bucci, Fiona Lobban. Originally published in JMIR Mental Health (http://mental.jmir.org), 01.11.2017.